There has been a recent rash of books about the gospel. There’s Scot McKnight’s The King Jesus Gospel, J.D. Greear’s Gospel, Andrew Farley’s The Naked Gospel, and Greg Gilbert’s What Is the Gospel?, among others that I’ve probably left out. What sets this book apart from the rest? I can’t say, because the only book I’ve read on the above list is The King Jesus Gospel. But I can tell you what makes this book interesting. The idea behind The Explicit Gospel is that, even for many people who grew up going to church, and are still part of a church, the gospel is implicit. It isn’t talked about; it’s “understood.” Which means that it’s not really understood at all. 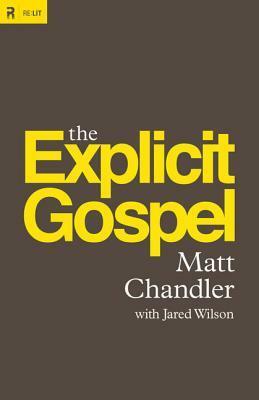 Matt Chandler, the preaching pastor of The Village Church in Texas, (along with co-author Jared Wilson) sets out to correct that with this book. He divides the book into three sections: The Gospel on the Ground, The Gospel in the Air, and Implications and Applications. The gospel on the ground is how the gospel affects individual lives: we are each separated from a holy God by our sins, and we need Christ as a mediator to rid us of our sins. The gospel in the air is how the gospel affects the entire universe: God created a good creation, which was marred by human sin. God’s plan is to reconcile the world to himself, and ultimately remake creation into a new heavens and new earth. In the final section, Chandler talks about the dangers of gospels that dwell on the ground and in the air too long, and finally draws a sharp distinction between the real gospel and moralism (trying to be a “good” person), which is often substituted for the gospel when it is not made explicit. What I loved about this book is that is a fine attempt to keep together two sides of the gospel that are sometimes separated. The gospel isn’t just about salvation, but it isn’t the gospel apart from salvation. The renewed creation is a huge part of the gospel, but God’s salvation of sinners shouldn’t be forgotten in the grand vision of the renewed creation. They are both essential. I don’t dismiss this book because of that 5%, though, and neither should anyone else. The Explicit Gospel is a great reminder of two things of which the Church in the United States is in constant need to be reminded: salvation and the renewal of creation are essential parts of the gospel, and moralism is not. Note: Thanks to Crossway for a review copy of this book. I was not asked to give a positive review.